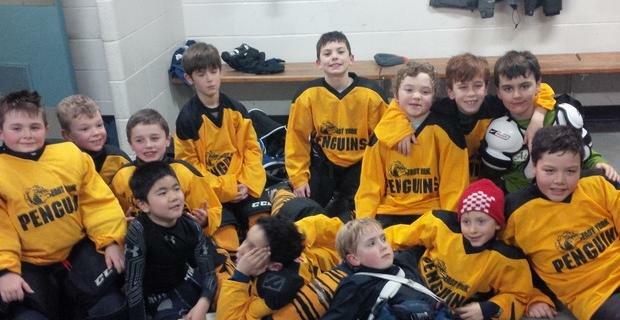 The East York Penguins have some fun after a recent game. But the parents behind the Penguins are just as important to the team's success. Don Phelps is one of my coaching heroes. Don coached in the Alberta Junior Hockey League for parts of four decades, winning 11 championships. But in the early 90's, Phelps decided to take a break from the Junior A battles and head down to the Bantam ranks to coach his son. As it turned out, the experiment lasted only a single season. "The kids were great," Phelps told me. "But the parents drove me nuts." the Calgary Canucks to a Canadian championship in 1995. Meanwhile, the list of sins from the pushy parents who drove Phelps back to the Canucks was pretty standard. Complaints about their kids ice time; who he was playing with; why little Johnny wasn't seeing power play duty, etc. Even in house league hockey, parents can be a problem. In fact, an official in the 8-year-old Novice house league I'm coaching in told me that one season, a hopped-up hockey dad used a stop watch to make sure his boy was getting the same ice as everybody else. Now, as a parent, you always want to make sure your child receives fair treatment, but breaking out a timing device seems a tad extreme. However, much like a certain Toronto mayor has been giving every politician a bad name, hockey parents too often get painted with the same brush due to the dark strokes of only a few; something that's very unfair. So far, so good. After an 0 and 2 start, we've bounced back to win 10 of our last 12 games, officially clinching second spot in the regular season standings. Much more importantly, the kids and coaches have had a ton of fun together and I'm proud to say we haven't had a single complaint from any of our Penguin parents. Playoffs are just around the corner and emotions are bound to go up a few notches. But with a great bunch of kids who have obviously been brought up by a fantastic group of parents, something tells me everything will be just fine.